Author: Fidèle Mpiranya. Series edited by: Bernd Heine, Wilhelm J.G. Möhlig. 8 pp. Roman, 87 pp. 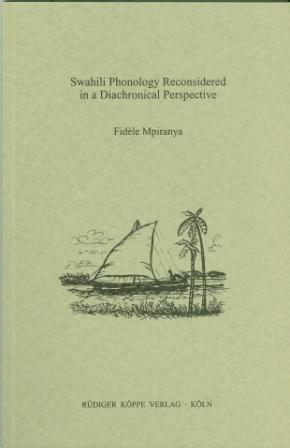 This study provides an alternative hypothesis to Swahili noun morphophonemics by introducing the concept of relative chronology. Thus, it shows that the seemingly irregular outputs of morpheme contacts in Swahili follow two morphophonemic rules separated in time; one which is relevant to Swahili as a stressless language and the other to stress language. Accordingly, it demonstrates that stress was introduced in Swahili in a relatively recent period. With regards to vowel length, this study challenges arguments presenting this feature as phonemically distinctive in Swahili. Hence, it argues that the relative vowel length observed in Swahili is dependent on the presence of stress or on morphemic contacts between vowels. [...] the reviewer would have to recommend the book for its thoughtful and interesting approach to a question which is of theoretical importance, and for its exemplification of the methodoloy of linguistic argumentation. John Stonham in WORD, 48/3, 1997, pp. S.